I’ve been doing a lot of running around lately and haven’t had much time at home. 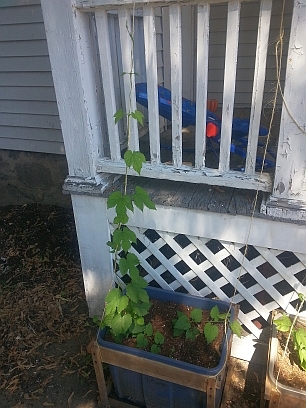 Thankfully, my bucket reservoir system (see my previous post on Preparing Hop Boxes here) has been keeping the rootstock at a nice level of moisture – never too dry and never too flooded. A bit of time, and a nearly two-week road trip later, I returned home on June 18, to find some nice bines stretching out and rigged some short climbing lines out of some cheap twine I had kicking around. As I want to be able to move if the fiscal opportunity arises, I really don’t want the bines to wrap the porch railings too tightly. Side shoots I can untwist later, but the main shoot needs to avoid being woven through the wooden structures – I can lower the line and gently coil the bines on the buckets if need be to move. They are starting to take hold solidly in their buckets. They will soon be ready for some ground cover in the form of creeping thyme and oregano. I noticed that one plant (a Goldings) had a single leaf well-chewed up by some itty critter, but no sign of the critter. There are no signs of mildews, root rot, or other possible bugs. 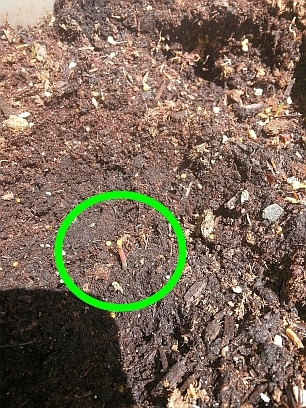 Nutrients from the M-G dirt are still holding strong – I’ll probably dose a little fertilizer near the end of the month. 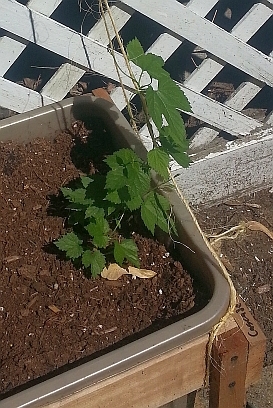 I also noticed that there was a 1.25″ hole extending into the dirt on my last bucket (Cascade #2). It’s possible that my neighbor bored the hole with the garden hose (he just told me that he’s watered lightly a couple of times…but he can be rather uncoordinated when he’s drunk – which is most evenings), but it extended past where I could reach with my finger with pretty parallel sides…thinking maybe a mouse…also thinking it may have munched the Golding rhizome that was in that bucket, as it’s the only one that didn’t sprout yet. Seriously debating a thorough flood of the bucket – see if I can flush out the bugger before the bucket drains (if I do, I’ll have to remember to fertilize to replace whatever nutrients I flush out). I am an apartment dweller, and am trying to keep my mobility options open, should the right brewing job upgrade suddenly require relocating . 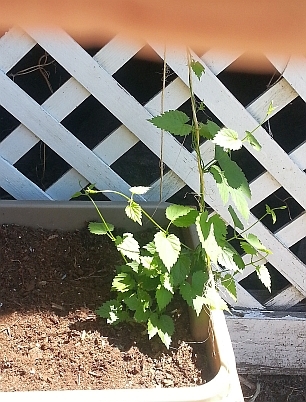 . . <whine> but I wanna grow hops! 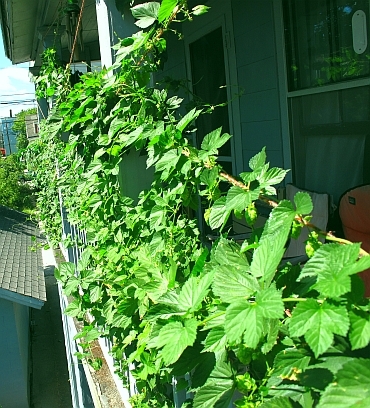 I previously grew some hops in 24″ round pots on a second-floor west-facing porch with moderate success. They only got direct light from early afternoon on. After three years, they were still going great. Some upheaval and a move and they are gone . 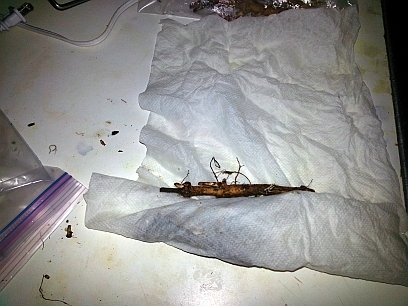 . . but I’ve ordered new rhizomes and they have arrived! So taking a look at this list, some ideas started to take shape. I don’t have a lot of extra cash, so would much prefer to scrounge from what I have and put on my Handyman cap. 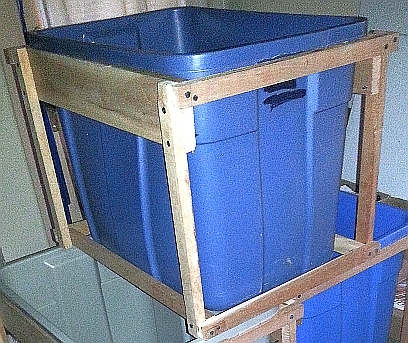 After getting some Red Green episodes playing in the background for inspiration, I discovered that I had (with minimal dumping/recompacting) several Rubbermaid storage buckets that were not being used (the lids of several were in use under fermentors to protect my hardwood floor). They were definitely cheap (#1) and larger than the 24″ rounds that I had used before (#2). As far as durability (#3), they were certainly able to withstand weather and wet conditions – but have you ever filled one to the brim with water and just stepped back? 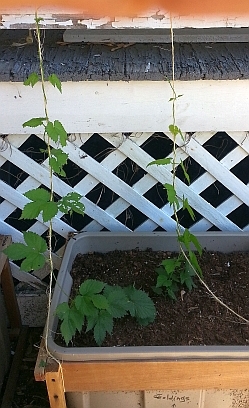 They tend to bow out and half-collapse (NOT something I wanted to happen to my hops). Trying to move one (#4) filled with wet soil and fragile roots without flexing it all and snapping roots is also difficult. Returning to the cheap scrounging, in my woodpile was a large number of narrow slats cut from quality cherrywood. They were from a project that was not finished when 1/3 of the raw materials were stolen from me (I’d been cutting small cubes for my smoker since, but hadn’t used it for much else). 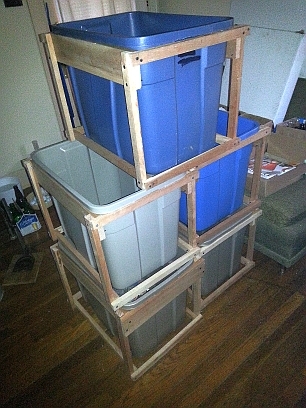 Using these and a couple of wider planks, I built support frames for each of the buckets. Every connection is double-tapped with 2-3″ outdoor-grade drywall screws. All of the holes were pre-drilled. I built the frames to be tight just under the rim and the bottom to just brush the ground when empty. To make it nestle in, I had to cut the handles off of the ends of the bucket (a set of wire cutters made short work of them). Now that I had containers, the next step was to consider their contents. A huge problem with potted plants of any kind is water management. Potted plants cannot rely on the root systems of other plants, hidden aquifers, etc. when they get dry – and it is all too easy to forget about them for a few days on the WRONG few days. It is equally disastrous when potted plants can’t drain and simply sit in a flood of stagnant dirt-water – the plant literally rots right off of its roots. 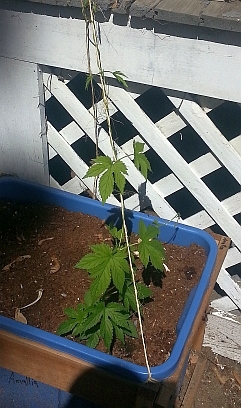 I’m planning to have these hops in the buckets for a couple of years, so I want this to work right. My plan is to build is a holding reservoir with a wicking siphon system. It sounds impressive in engineering terms, but in practice it is quite simple once you understand how it works. To make sure that my plants don’t go dry, I am setting aside the very bottom of the containers specifically to hold water (#5). This means that instead of putting my drain holes on the bottoms of the buckets (like most plant pots), I drilled them partway up the sides. Also, since I am intentionally storing extra water (and will be supplying it back to the soil), I can let new water drain quickly from the soil to the reservoir or out of the bucket – in other words, I can use MUCH bigger drain holes (#6). There are 2 holes on each side and one on each end – all are 1/2″ diameter and approximately 2″ up. To isolate the water reservoir and prevent it being filled with soil, we need some sort of separation. There are fancy screens and false bottoms (sound familiar? ), hydroponic rocks, and expanded stone fillers that all work well and have their strengths . . . price is not one of them. 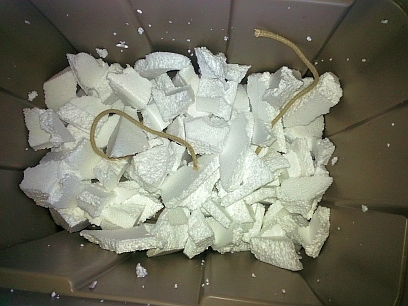 However, the kitchen at work had some equipment come in packaged in odd-shaped beadboard (white styrofoam) – an inert buffering substance that does not break down in wet conditions and would otherwise take up space in a landfill . . . and (dum- da-da -dum!) free (#1). 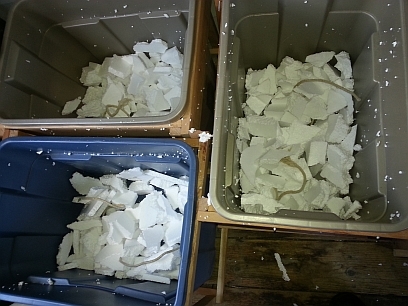 I broke the styrofoam into mid-sized odd-shaped pieces and layered them into the bottoms of the buckets, making sure that there were at least 2-3 layers. As these layers settle under the weight of wet soil, they will press down without crushing, creating a coral-like network of water caves. To seal it off from the soil that wants to drop through, I will be covering the beadboard with a thick layer of peat moss. The peat moss will act as a filter bed – it is porous enough that it tends to stick to itself and allow the liquid to drip through. It can also trap some nutrients that the soil can wick back up from direct contact. However, the soil can’t get to the water at the bottom in the reservoir (#5). A wick is one of the simplest forms of on-demand siphons. A rummage through my camping gear (#1!) turned up a chunk of nylon-cored, cotton-wrapped 1/4″ rope. I cut a few lengths and coiled some across the bottom of each bucket, under the beadboard. In each bucket, I pulled both ends up through to make two wicks. The nylon threads at the core will help keep the wicks in place all the way up through the soil while the water will slowly travel along the cotton fibers as the soil drys and absorbs more water from the wick (#5). 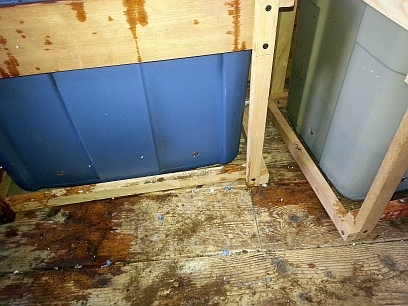 Once the wicks were in place, as mentioned, a 1-2″ layer of broken-up peat moss was layered over the beadboard and wetted down. Once the layer was more cohesive and less dusty, alternating layers of soil and peat moss were layed in, always making sure to continue keeping the wicks penetrating each layer (#5). By using good-quality pre-mixed potting soil (on a budget, so I used Miracle-Gro Potting Mix), I ensure that I have a solid set of both quick-use and long-term nutrients in my soil (#7). Alternating 1-1.5″ layers with peat moss distributes the nutrient-rich soil to all areas for roots, while preventing any compaction or “rocking up” that would present problems for the roots (#8). Each peat layer creates a buffer drainage zone where over-wet potting soil may find close drainage relief that can transfer it across the layer to a drier area. The peat also acts as buffer filters, helping to retain more of the nutrients being leeched by drainage or being added with watering later in lifecycle (#7). 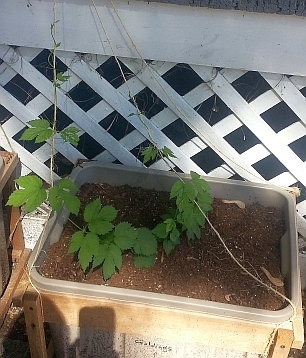 Hop bines need to climb and this is a good time to consider how your are going to support them. If you need to mount a pole, ring, tiedown, etc. to your bucket or frame, it is easier to make those modifications now than when you have a big plant in your way. I will be letting them climb the railings along the 3-story outdoor stair on my apartment building, so that’s done-and-done (#9). (I have wool twine ready if I need to direct it more). Two of the biggest threats to hops are bugs and molds. In NH, the bugs are relatively a non-issue (for the plants, anyway – we have tons of mosquitos and blackflies). 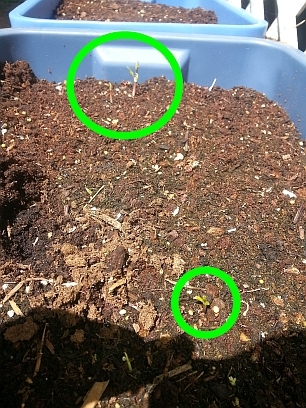 Some birds munched the first couple of shoots and I think a mouse or squirrel was digging for seeds, but I covered the tops with a thick layer of peat moss as a mulch and that stopped (#10). Downy and powdery mildew are concerns even here in New England. Having my plants isolated in pots, starting high above the grass and not near any other shrubs gives them an advantage, as does the steady light breeze (#11). Once the bines reach a few feet high, it is also good to strip the leaves off of the bottom 1-3′ for further isolation. Once the bines have become established strongly, I will be adding some ground cover to protect from critters and heavy rains/dry spells. I have seeds for ground-cover-style thyme and oregano. 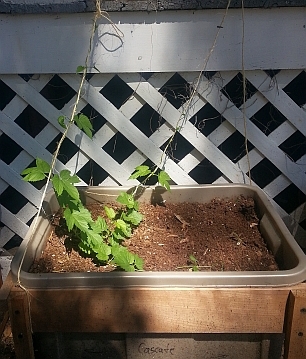 Neither of these plants reach down more than a couple of inches, and create an aromatic (i.e. anti-pest) layer of edible greenery that also acts as a mulch (#12). Opening the box and unwrapping the bubble-wrap with eager anticipation, I was (again) not disappointed. 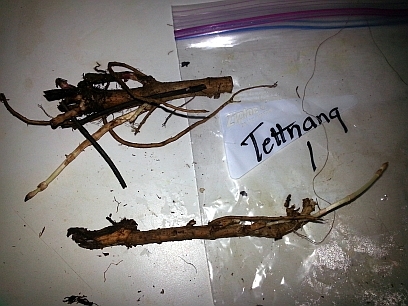 I had placed an order for 1 Tettnang, 1 Golding, 1 Amallia, and 2 Cascade rhizomes. Once again, Vickie hooked me up and I received 3 Cascades and 2 each of the others. 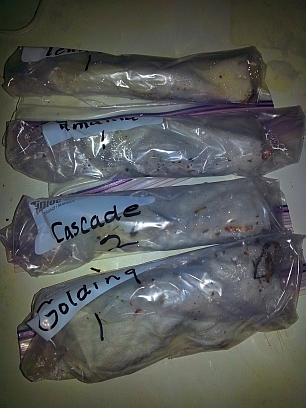 (Last time, I had ordered 1 each of the Cascade, Fuggle, and Willamette and received 2 of each.) Thank you Vickie! 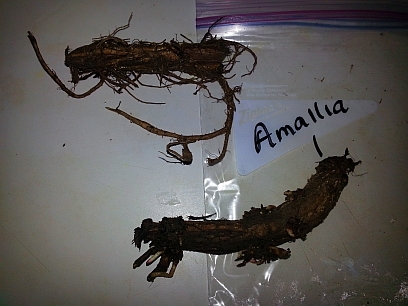 Not only were there extra rhizomes packaged, they were all showing significant early sprouting with numerous shoots off of every rhizome (some a couple of inches long). They were also quite large, including a MASSIVE Golding root. These photos can be a little deceiving – I should have added in something for a size reference. 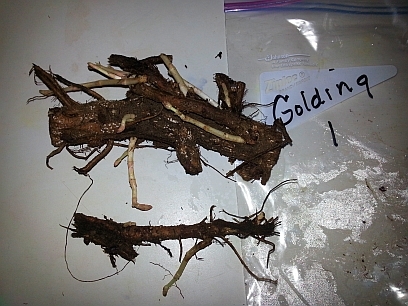 These are GALLON ziploc bags, if that helps…and the big Golding rhizome is nearly the full width of the bag and over an inch thick! 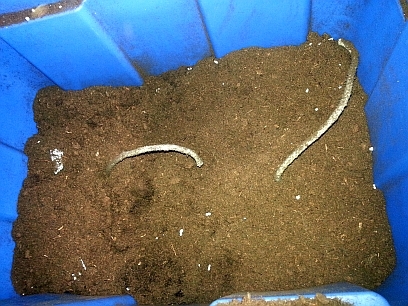 After an inspection (and some pics), I needed to store the rhizomes until I can plant them. I don’t currently have the containers, soil, or soil amendments to get them going – I’ve been on the run for the last three weeks (as my lack of regular posts lately attests). 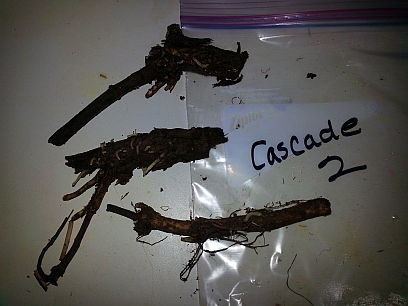 To make sure they don’t dry out, each bag was opened and the rhizomes were gently wrapped in two damp (but NOT dripping) paper towels. After wrapping, they were carefully placed bag in their bags. Each bag was gently rolled and the excess air squeezed out (again, GENTLY…don’t break those young shoots!) before being sealed shut. All four bags are currently being stored in the deli/crisper drawer in my refridgerator. Hopefully I can source some containers this weekend and get them in some dirt next weekend. Stay tuned for updates on how they’re doing…by late June, these babies will be popping up to the tune of 12-18″ PER DAY!